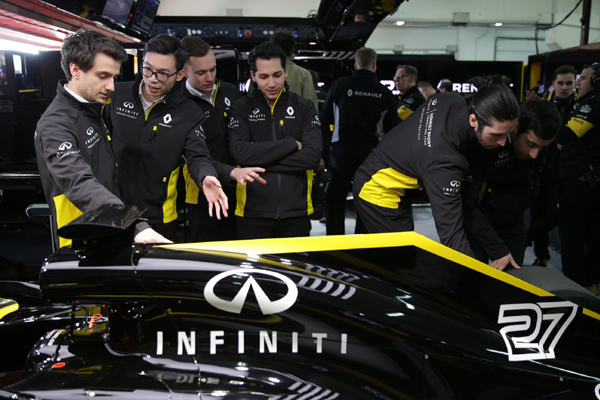 Infiniti has launched the 2018 edition of its highly successful Infiniti Engineering Academy, its fifth consecutive year recruiting the best engineers worldwide to work both with Infiniti Motor Company and Renault Sport Formula One Team. This once-in-a-lifetime opportunity is aimed at highly driven students looking to venture into the vehicle engineering industry, where they will brush shoulders with some of the most experienced engineers within automotive and Formula 1, said a statement. This new edition of the Infiniti Engineering Academy will also benefit from unprecedented access to Formula 1 circuits during Grand Prix weeks, with six of the seven academy finals being held trackside (Canada, Silverstone for the Europe Final, Singapore for the Asia and Oceania Final, US, Mexico, and Abu Dhabi for the Middle East Final), it said. As a result, the Infiniti Engineering Academy finalists (10 per participating region) will be granted access to the Renault Sport Formula One Team’s pit lane, garage and motorhome areas on the Thursday before their local Formula 1 Grand Prix, where they will carry out several challenges under the watchful eye of Bob Bell, Nico Hülkenberg, Carlos Sainz, and other members of Renault Sport Formula One Team, it added. “The academy is one of our most successful projects and we are very proud of the impressive growth of this programme year after year, both in terms of student applications and awareness. In 2018 we will offer again a once in a lifetime opportunity to seven young engineers from all over the world, confirming our commitment to talent and diversity,” he said. “Furthermore, we’re incredibly pleased that this year the winners of the Infiniti Engineering Academy will be selected trackside during Grand Prix weeks - the perfect setting for engineers to compete for a place in this unique programme,” he said. For the 2018 edition of the academy, Infiniti has also partnered with Harvard University Professor Dr Julia Minson, who specialises in decision science. Dr Minson will work with the academy to conduct ground-breaking research into decision making in engineering, and how the very best engineers perform under pressure to make decisions when faced with vast amounts of complex data. The learnings from the research will then be incorporated by both the Infiniti engineering and motorsport teams to optimise their decision-making processes, said a statement. Dr Minson and her team will also support Infiniti during the engineering academy recruitment process and assist the judges during the Finals to ensure that the best winners are selected. With increasing registration numbers year-on-year (the 2017 edition attracted over 12,000 registrations from 41 different countries - a near-threefold increase on the previous edition), competition to secure one of the seven places available globally is fiercer and the calibre of the candidates higher than ever. “It’s a fantastic initiative that takes recruitment in F1 to a whole new level, and brings new and diverse talent to the sport, which is crucial to its future development,” he said.